My mother believes you should use your nice things. She does. She dines on her grandmother's china daily -- an irreplaceable pattern. She still has her everyday dishes, too. Me? I'm more practical and my children even more so and I've been through multiple sets of dishes because mine just wear out with chippage from herd feeding. Dishes are something we use ALL THE TIME. Now that I have time on my hands and grown children, what do I do? Use my grandmother's china, or my own, or my youngest's that I keep for her hope chest? Not often. With a daughter getting married last year, and the other children off at college, I could eat off china plates everyday. If I wanted to. 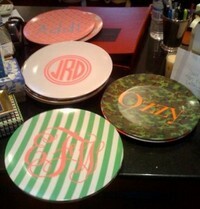 Looking at these cute monogrammed plates, left, last month as a potential wedding gift, I started thinking about dishes in general. I've given hand-made one-of-a-kind decorated plates from Santa Fe's Rainbow Gate for gifts and I hang plates on my walls and love using special plates. I think I'll order personalized plates for special occasion gifts in the future. But for me, now, for everyday? Feeling like a new bride, off I went to pick out new dishes for my husband and me to enjoy, and I came out with something practical, below right, that can go into the microwave and dishwasher and is decently priced, simply decorated and practical and promptly broke two bowls washing them to put up. Oh well. So goes life. 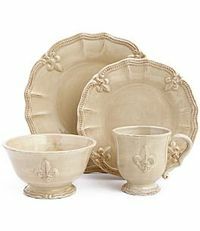 The Francophile in me loves the fleur-de-lis pattern. I poured over plates online. I visited multiple stores. I made my husband go to a few, picked out various dishes from several places to compare at home. I never spent this kind of time picking out my own original or subsequent dishes. Empty nest? Nesting after a series of moves? Re-nesting? Nesting redux. I'm not a second bride, I say to sales clerks. One of the places to consistently enjoy creativity, company and life itself is at the table. Now that my table is less full of people on a regular basis, I wonder if mealtimes will dwindle in pomp. Now that I have more time, I am wanting to pull out recipes and spend more time in the kitchen. What has gotten into me? I like those, pretty and practical! I'd say it's less what has gotten into you and more what you've gained - TIME to actually think about things like cooking from recipes! My mom uses her good stuff every day, too. Me? I don't have "good stuff". When we got married, we already had a baby girl and nothing to call our own. The last thing I cared about was registering for china and crystal when I needed things like brooms and sheets! Also some Johnson Brothers Blue Willow that belonged to his grandmother, but that set got split up amongst the grandchildren who were interested, so we only have a few dessert plates. I had good china from my first marriage, which I used fairly often (no kids from that union) but did not get custody of in the divorce. I have a set of Christmas china (Nikko) that we start using right after Thanksgiving and well into January.